Last month, Milwaukee’s first Golden Corral opened on Layton Avenue. 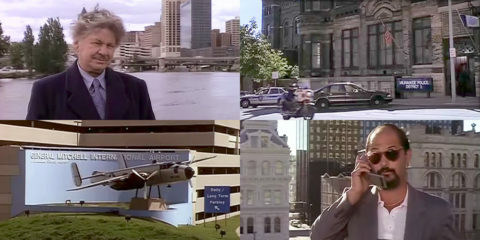 For reasons we can’t quite grasp, the franchise’s arrival on the airport-adjacent causeway—which is also home to some quietly great restaurants like Kim Thai, LaLa’s, Pho Hai Tuyet, along with the venerable likes of the Nite Owl drive-in and The Packing House—came with its fair share of excitement. The buffet chain’s gargantuan parking lot is full at all hours of the day and, after being told there would be a 45-minute wait to even get in when one contributor attempted to visit, we delayed (and possibly might flat-out abandon) our all-too-expected article about gorging ourselves there. While Golden Corral seems to have captured the interest of hordes of hungry metro Milwaukeeans, we were far more interested in another restaurant’s arrival just a few blocks away from that buffet. After months of renovations and preparation, Pita Palace (789 W. Layton Ave., 414-988-8100) officially opened for business on July 23. 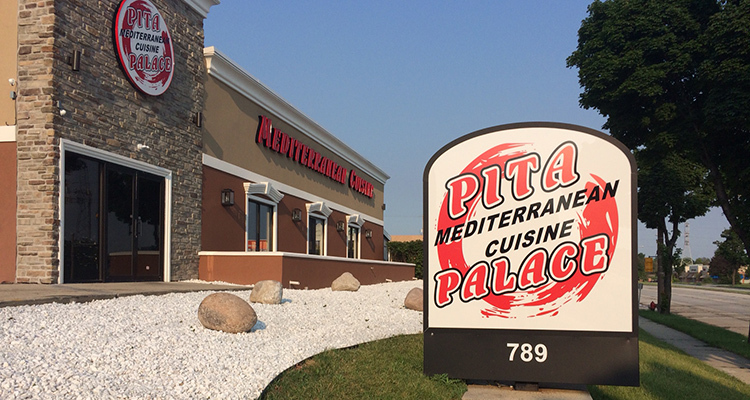 The most exciting aspect of Pita Palace is the restaurant’s ownership affiliation with Al-Yousef, an excellent Middle Eastern market and restaurant that’s buried deep in Oak Creek. Could there really be a place to get Al-Yousef-caliber cuisine in Milwaukee proper? We wasted little time before driving past the full Golden Corral parking lot and, instead, paying a visit to Pita Palace. The space: The first thing you’ll notice upon entering Pita Palace is, well, it’s a palace. The high-turnover property, which was most recently the home of a Western-themed bar and grill called Wild Bill’s Sports Saloon, has been almost completely overhauled. Outside, the facade is updated, the siding has been stripped and repainted, and considerable landscaping efforts didn’t go unnoticed. Inside, the Big Buck Hunter HD: Duck Dynasty Edition machine, the Fast And The Furious racing games, the army of flatscreen TVs, and any semblance of a Western motif are all long gone. In their place, diners will find pillars, chandeliers and other swanky lighting fixtures, brand new tile flooring, and subtle interior accents like plants. They’re fake plants, but plants nonetheless. With the removal of the bar where Wild Bill’s briefly slung beers and sugary cocktails, the dining area is considerably more spacious. Pita Palace has close to 30 tables, ranging from a cluster of two-tops to some 4-tops (some were pushed together to accommodate a large group during our latest visit), and a few booths. The only remaining TVs display the restaurant’s menu over the counter at the rear of the establishment. Despite the decidedly fancier feel, Pita Palace is an over-the-counter restaurant with fairly fast turnaround on orders, and lots of customers seeming to avoid eating there in favor of taking their food to go. That’s not a shot at the business, of course. Just don’t let the stone pillars dissuade you from coming in with a t-shirt on and grabbing something quick over your lunch break. Milwaukee Record‘s food: We—under-dressed as always—stood near the counter with a menu in hand for a long time before just deciding to order a whole bunch of stuff. Our Mediterranean mastication tour started with a Chicken Shawarma Plate ($9.99) and a bottle of a popular Middle East and North African pomegranate non-alcoholic beverage called Barbican ($1.99). The latter was…interesting, but we’ll probably stick with one of the fountain Coca-Cola products next time around. Conversely, the heaping platter of tender halal-certified and spit-roasted poultry steaming atop seasoned yellow rice was excellent. When the main components were combined with the diced onion, tomatoes, and cucumbers, as well as the rich and delicious house-made hummus, it was elevated all the more. Though the shawarma plate was quite filling on its own, we boldly pressed on and ordered a Falafel Sandwich ($4.99). The “sandwich”—closer to a wrap, but whatever—includes three pieces of the Palace’s fresh homemade falafel. Those three balls were cut in half and crammed inside grilled and golden shrak bread (pita and Lebanon bread are also available). The fried orbs of crispy chickpea are accompanied by Jerusalem salad (diced onions, cucumbers, and tomatoes), pickles, creamy tahini sauce and hummus, and pickled red onion. It was dense, compact, delicious, affordable, and something we’ve been craving since the day we ate it. Already fans of the Chicken Shawarma Plate and the Falafel Sandwich, we decided to finish our middle eastern pilgrimage with a combination of the two. Get a meal that can do both, right?! Yes, we concluded our Pita Palace feast with a Chicken Shawarma Sandwich ($5.99), which offered all the same ingredients as the previous shrak wrap we had (except chicken subbed in for falafel), as well a matching level of execution. Wanting to see how the highly-touted falafel fared on its own, we treated ourselves to a six-piece order ($2.99). Made fresh and served both crispy and piping hot, we hope you’ll forgive us for eating one piece before taking the photograph below. Of course, Pita Palace isn’t just shawarma and falafel. There’s a wide variety of hot and cold appetizers, ranging from hummus and arayes (pita bread stuffed with cheese) to bana ghannoug and foul madamas to chicken wings and lentil soup. There’s an array of entrees that run the gamut from beef and chicken shawarma or kabobs, ribeye steak and lamb chops, and some falafel- and mixed vegetable-based meals. There’s also a list of extensive family meals, which run between $45.99 and $89.99 and feed anywhere from four to 10 people. And yes, there’s dessert: kanafeh, baklava, warbat, and harissa. There’s just too much to try in one visit, so we’ll just have to stop by again. Somebody’s got to do it! The verdict: Whether a result of being a fairly young establishment that’s still figuring it out or simply not possessing the inimitable charm of a secluded middle eastern grocer, Pita Palace didn’t quite compare to Al-Yousef. That said, this newcomer on Layton Avenue is still very good, and we’d venture to say its falafel is better than that of its associated predecessor. Combine that with a spacious and comfortable dining room, a location that’s in Milwaukee itself, and a larger menu, and Pita Palace has definite staying power. Wait in line at Golden Corral if you want. You can find us a few blocks away.